After six decades of strong, uninterrupted presence in the Greek tourism sector, the Divani Group continues to be an industry leader. The ever-increasing demands and challenges of the international market in which it operates have not deterred the Group from its commitment to implementing a successful investment plan which, in turn, has been instrumental in securing the company’s continued success over the years. The Divani story began in Thessaly, in central Greece, in 1958 when Aristotle Divanis, on the advice of Greek Prime Minister Konstantinos Karamanlis, inaugurated the first hotel in Trikala, thus entering the newly emerging tourism and hospitality market. The launch of this first hotel was a groundbreaking and innovative event, particularly as each of the 65 rooms had private en-suite facilities. A strong entrepreneurial spirit combined with a newly discovered love of hospitality resulted in Mr Divanis withdrawing from all other commercial activities and focusing exclusively on the hospitality industry. Armed with an astute sense of market trends, Mr Divanis predicted an increased tourist interest in Meteora and made the major decision to open a second hotel there in the town of Kalambaka. By 1974 the Divani Group had evolved into the largest hotel group in Thessaly, soon opening its third hotel in the city of Larissa. After multiple successes in Central Greece, it seemed inevitable that the Divani Group would next set its sights on the vibrant Athenian hospitality sector. By the end of a second successful decade in operation, Mr Divanis and fellow businessman Mr Zafolia launched the fourth Divani hotel under the shadow of the Acropolis. Mr Divanis’ decision to open his first Athenian enterprise next door to the most popular, internationally recognizable monument in the country was no coincidence: the Divani Acropolis soon became automatically associated with the eponymous landmark. The Group’s expansion to Athens was an undoubted success, and within ten years a second venture was established in the city center. The Divani Zafolia Alexandras was opened in a historic building, its elegance standing out in the midst of a radically changing and modernizing city. After sealing the Group’s successful presence in Athens by the start of the 1980s, Mr Divanis set his sights even further by investing in Corfu, the largest Ionian Island and an increasingly popular destination for British tourists. The Group entered the market with the acquisition of the Corfu Kanoni, transforming it into Divani Corfu Palace, a luxury hotel bringing a uniquely elevated level of hospitality to the island. After completing his postgraduate studies in 1986, Spiros Divanis, son of Aristotle Divanis, entered the business. He brought with him the innovative ideas of a younger generation which, in combination with his father’s invaluable experience, were instrumental in taking the Group to the next level. Despite a difficult economic period for Greece, the Divani Group was able to strongly reposition itself within the Athenian market and succeeded in the purchase of the enigmatic Caravel Hotel. Within three years of opening, the Divani Caravel had become the most profitable hotel in Athens and became the preferred venue in which to host successful domestic and international conferences and events. In 1998, whilst celebrating its 40th anniversary, the Divanis Group took another bold step by acquiring the iconic Apollon Pallas in the southern suburb of Vouliagmeni, on the Athenian Riviera. Not only was the move a strategic investment, but it was also one which brought local and international acclaim, as well as recognition of the Divani Group’s market leadership. Divani Collection Hotels’ fifth decade brought important distinctions on a global level. The radical refurbishment of the Apollon Palace, now renamed Divani Apollon Palace & Thalasso, as well as the creation of a 3,500 sq. m (38,000 sq. ft.) state-of-the-art thalassotherapy spa and the ‘Aristotelis Divanis Convention Center’ lay the foundations of the Group’s updated image. 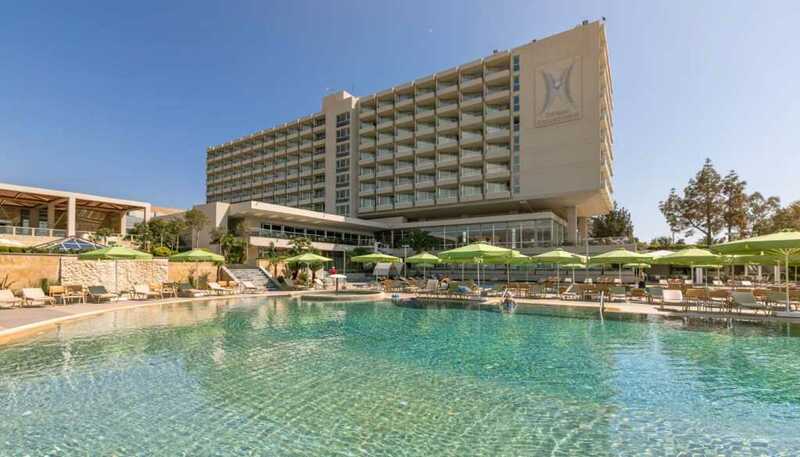 International recognition and entry into the global hospitality elite promptly followed, with the inclusion of Divani Apollon Palace & Thalasso into the ranks of Leading Hotels of the World, an invitation also extended soon after to Divani Caravel. Finally, the Group’s continuous effort to provide unique services as well as make strategic investments led to the acquisition of another hotel, the Divani Apollon Suites. Today, Divani Collection Hotels consists of seven hotels, each one possessing its own distinct character and identity, yet all offering the same high level of services that the Group has become known for. Part of its strategy is the decision to continuously refurbish the properties in order to maintain the superior standards that Divani Collection Hotels has based its reputation on. After 60 years of unrivaled dedication to the hospitality sector, the Divani Group continues to work with the same passion and is intent on introducing new innovations and ideas which will meet the high expectations of every guest. Nowadays, visitors can enjoy memorable moments at the spa or gym, benefit from the latest high-tech equipment for event & conference planning, and enjoy a range of unique gastronomic experiences in the restaurants and bars. The third generation of the Divani family continue to hold key positions within the Group and plays an active part in all of its developments. Honoring the vision of its founder, the Group has progressed further than could ever have been imagined, embracing the new era of hospitality with great success and laying the groundwork for a prosperous future. Beginning with the desire to create unforgettable experiences characterized by authentic Greek hospitality and the highest level of service, gastronomy has always been a large part of the Group’s vision and has seen significant investment. Each one of the Divani Collection Hotels’ venues have been designed to radiate their own distinct style and aesthetic, offering inspired fine dining as well as premium drinks and cocktails for all tastes and occasions. Making use of only the finest, freshest ingredients, every restaurant and bar highlights its own style by combining the unique surroundings and location with contemporary trends in local & international cuisine and fine drinking. Signature Packages: Guests at Divani Collection Hotels are invited to celebrate the Group’s diamond anniversary by enjoying the range of special offers that have been created for the occasion, from accommodation packages to spa programs. Hotel and Restaurant Refurbishments: The diamond anniversary is a milestone for the continuation of many important renovations work started by the group in the last years. The historic Divani Caravel has undergone significant renovations in a large number of its rooms and suites, culminating in the creation of an exclusive category of luxury Divine Suites. Meanwhile, the Divani Apollon Palace & Thalasso, which dominates the Athenian Riviera, has also seen many of its rooms updated whilst the hotel restaurant, ‘Mythos by Divani’, has received an impressive new facade. The exterior area was also subject to renovation as part of the overall decision to match the complex to with highest standards provided by other international luxury hotels. Finally, 2018 will also see the renewed Divani Palace Acropolis welcome guests to its elegant, newly modernized rooms, which have been designed to complement its prime position in the shadow of the Parthenon. Technological Superiority: The spirit of rejuvenation is not restricted to the Group’s hotels alone but also to the wide range of services which it offers with the aim of providing the ultimate hospitality experience. Taking into consideration current trends and the needs of the modern traveler, the Divani Group has evolved on a digital level too, with a totally revamped website and the implementation of state-of-the-art information management systems in order to ensure a seamless and ultra-modern stay for every guest. A new image for the Divani Collection Hotels: Determined to honor its historic past but recognizing the modern reality of instant communication and social media, the Divani group has been focusing on the rebranding of its corporate identity. This priority aims to craft a fresh approach to communicating the ethos and values that have enabled the company to maintain a strong hospitality sector presence for the past 60 years. The Divani Hotel Group is comprised of seven hotels in Greece (four in Athens, plus Meteora, Larissa and Corfu) and has had a strong and successful presence in the Greek hospitality industry for 60 years. The Divani Hotel Group was founded in 1958, in the early stages of the Greek tourism and hotel industry. With values and ideals that spring from a genuine love of hospitality, as well as for catering to the unique needs of each and every guest, the Divani Group has been proven to be a leader in its field. Its innovative ideas continue to influence the wider tourism sector in Greece, with its high level of service across all departments, unique character and family atmosphere, setting unparalleled standards in the luxury hospitality industry across the country.